"The Rallycross Grand Prix. 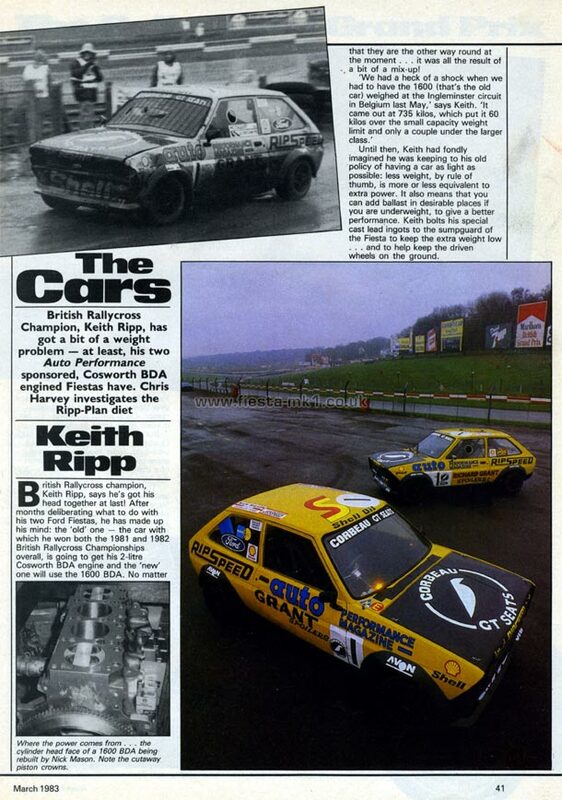 The Cars"
British Rallycross champion, Keith Ripp, says he's got his head together at last! After months deliberating what to do with his two Ford Fiestas, he has made up his mind: the 'old' one - the car with which he won both the 1981 and 1982 British Rallycross Championships overall, is going to get his 2-litre Cosworth BDA engine and the 'new' one will use the 1600 BDA. No matter that they are the other way round at the moment ... it was all the result of a bit of a mix-up! Bottom-Left - Where the power comes from . . . the cylinder head face of a 1600 BDA being rebuilt by Nick Mason. Note the cutaway piston crowns.